Another brilliant mall in Chennai, the Skywalk mall is set amidst the hustle and bustle of the Aminjikarai on the banks of Cooum River. 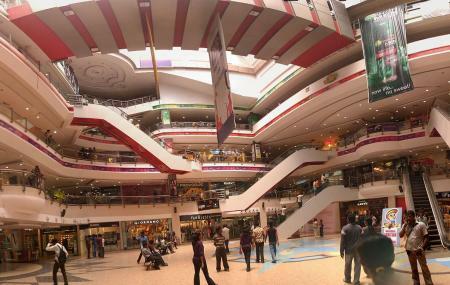 Sprawling across a good three floors well-equipped with enough engaging and entertainment opportunities, this mall is an ideal place to spend the day out in Chennai. Apart from the usual retail options, you will also find here a food court serving delicious food, a 7-screen multiplex, and a games zone. Thus, making it one of the best things to in Chennai with kids. How popular is Ampa Skywalk? People normally club together Chetpet Ecopark and Abhirami Mega Mall while planning their visit to Ampa Skywalk. Wonderful place to visit with your best one.. nice place to spend time.. suitable for family and friends.. very old and famous mall in Chennai.. Easy to walk around the mall but can't find more brand showrooms due to it's build in smaller area.. It requires lot of improvement maybe soon in future.. Good washrooms.. cleanly maintained place.. staff's are good and friendly..
One of the few malls that sprang in Chennai, still lively and attracts quite a good amount of crowd almost daily. Has all kinds of entertainment from movies to shopping stuff and also restaurants. This place, even though has become quite old now is still maintained decently. Parking is sometimes hectic but that's quite usual for all malls. Overall this is a good place to get some relaxation or a move from home. Easy to reach mall with lots of outlets and restaurants. Best place for bunch of friends to hang out with. Neatly maintained premise. Though the theater is a bit small comparatively, it gives equally good movie time. Yet the snack bar rates are a bit atrocious. You could get a snack shop for the popcorn rate! Weekend walk-in be there at ampa! Wonderful place to hangout with Dear ones. Spacious parking lot and but very costly parking fees. I was there for 3 hours they just charged 120 rps for bike parking. The food court is amazing. The have several restaurants and we have a wide range to choose what we wanna have. The rest rooms are clean and well maintained. The theaters are delight to watch. watching movie in Dolby 7.1 was just top notch. had the best experience. I would recommend everyone to at least go for once and enjoy.